Lifting Lives Ministries, Inc., a 501(c)3 non-profit, exists to lift the lives of homeless families from discouragement and despair to enthusiasm and empowerment through nutrition and nurturing, modeling and mentoring in a Christian environment. 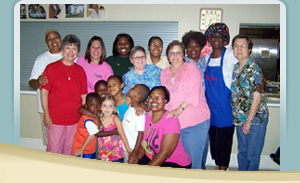 Please click on the "About Us" tab at the top of the page to learn about our mission and programs. Lifting Lives Ministries serves homeless families of Vicksburg-Warren County and the surrounding region, and continues to raise operational funds for its large Family Shelter facility which serves twenty (20) homeless families (110 mothers, fathers, and children). It is the only family shelter in Vicksburg (and this region) and less than four are known to exist in Mississippi. According to the January 2013 U.S. Department of Housing and Urban Development Point-In-Time survey (a surprise count on a single night), HUD found 610,042 individuals to be homeless of which 85% were individuals while 15% were in families. Families experiencing homelessness made up 50% of those who were sheltered. In Mississippi, roughly 21% of families live in poverty, and a report by the National Center on Family Homelessness reveals that Mississippi has one of the highest child homeless rates. Lifting Lives Ministries needs your help to operate the Lifting Lives Family Shelter. Please click on the “Family Shelter” tab at the top of the page to learn more. Lifting Lives Ministries, Inc., is led by Executive Director, Joel W. Dimmette, Sr., and governed by the board of directors, who are Dr. Willie Nettle, Mrs. Nellie Caldwell, Ms. Bobbie Heads, and Dr. Stan Woodson. Truly, words cannot express how excited we are about serving homeless families in the Vicksburg community. There is much work to be done! Please consider partnering with LLM to lift the lives of others today. :: Donate :: Contacts :: Home :: ©2012-2017 Lifting Lives Ministries, Inc. | All Rights Reserved.